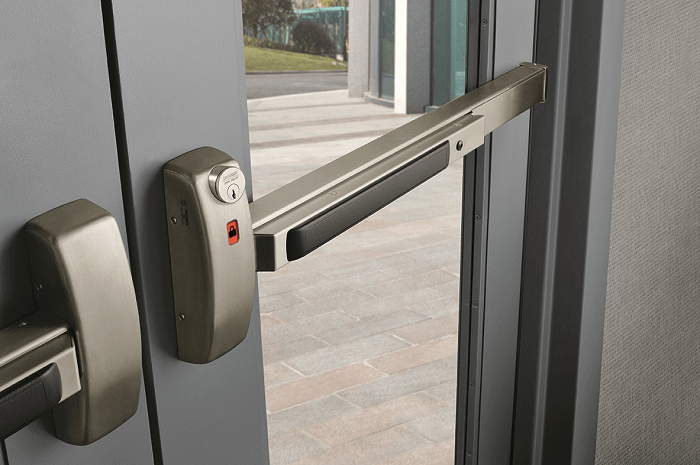 If you own or work in a commercial building or one with heavy public traffic, you will need to meet certain qualifications for panic bar & fire exit hardware for doors. The reason for this is to make sure the occupants have a safe way to quickly exit during an emergency. Your local code requirements will determine which type of exit device is appropriate and needed for your specific needs. Panic hardware must consist of a door-latching assembly incorporating an activating device. The activating device is usually a horizontal bar or push pad that causes the door to unlatch when a force is applied in the direction of egress travel. Have a maximum unlatching force of 15 pounds and able to be opened without special effort or knowledge. The activating portion of the releasing device must extend at least one-half the width of the door leaf. On balanced exit doors, the activating device must be a push-pad type and may not extend more than one-half the width of the door leaf from the latch side. The activating device must be mounted at a height greater than 34 inches but less than 48 inches above the finished floor. The actuating portion of the releasing device shall extend at least one-half of the door leaf width and the maximum unlatching force shall not exceed 15 pounds. If balanced doors are used and panic hardware is required, the panic hardware shall be the push-pad type and the pad shall not extend more than one-half the width of the door measured form the latch side. In words a bit easier to understand, the difference between panic hardware and fire exit hardware basically comes down to one allowing fast exit in an emergency and the other allow a quick exit with some limitations for non-emergency use. Panic hardware & Fire Exit Hardware are two different types of exit devices. The most obvious difference is the lack of mechanical dogging on a Fire Exit Device. Some internal parts may be different and the method it is secured to the door may vary. Panic Hardware – An exit device that is used on a door that is not intended to be used as a fire door. Panic hardware allows the latches to be held retracted to create a push/pull function. Panic hardware is designed to provide building occupants fast egress in the case of an emergency. Because of its durability and ease of use, panic hardware is often installed on doors that don’t require it by code. Fire Exit Hardware for Doors – Fire exit hardware is panic hardware that is listed for use on fire door assemblies. These doors must be labeled as a fire exit with words “Listed” and “Fire Exit Hardware” and indicate a control or serial number. An exit device that is designed to be used for both panic and fire conditions and is required to be used on doors used during an emergency evacuation in case of a fire. Fire exit hardware does not incorporate mechanical dogging. Fire exit hardware must have positive latching. The swinging fire doors must be closed and positively latched to protect exit stairways, corridors, and other areas of the building from the spread of smoke and fire. They also must self close and automatically latch after each use. Dogging devices are not permitted because swinging fire doors are required to positively latch. A dogging device mechanically defeats the latching feature of panic hardware preventing the door from positively latching when in the closed position. Dogging devices are usually activated manually with a small wrench or tool. Feel free to contact our commercial locksmiths for more information.